Salesforce.com Inc. (CRM - Get Report) has been setting new highs on the notion that its cloud computing applications will see strong global demand in 2019. With a P/E ratio above the clouds at 126.02, according to Macrotrends, the stock may have good news priced-in when the company reports earnings on Monday, March 4. 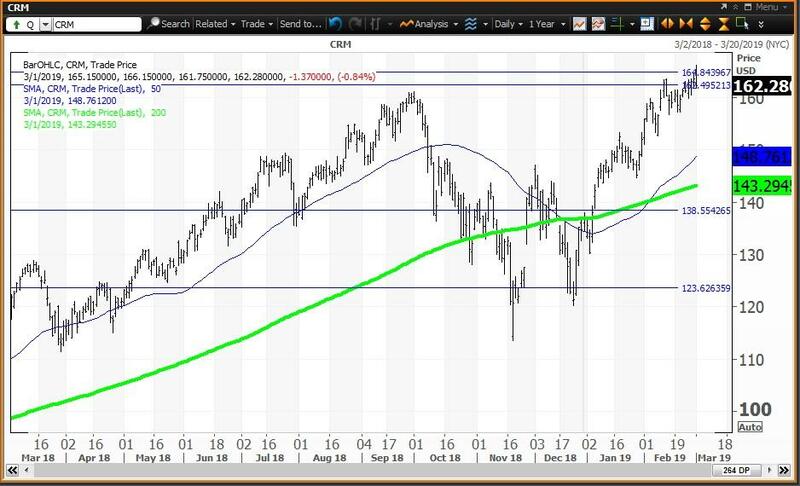 At Friday's close of $164.53, the stock is up around 19.5% so far in 2019 and in bull market territory 44.1% above its Nov. 20 low of $113.60. Salesforce set its all-time intraday high of $166.15 Friday morning, which is above my quarterly risky level, now a pivot (or magnet) at $164.96. 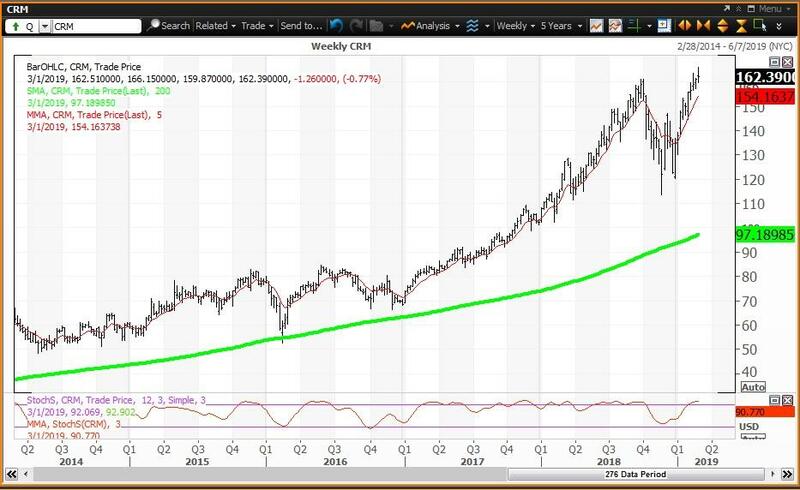 The weekly chart for CRM shows an extremely overbought weekly stochastic reading putting the stock in a category I call an "inflating parabolic bubble." Analysts expect Salesforce to earn 56 cents a share when it reports after the closing bell on Monday, March 4. Wall Street expects Salesforce to benefit from global expansion on overseas demand for cloud-based applications. This growth is being helped by partnership agreements with major companies such as Amazon (AMZN - Get Report) and Alphabet (GOOGL - Get Report) . "We are bullish on shares of CRM as we view Salesforce as a key player in the digital revolution" and invaluable to those companies looking to build out their digital strategy and better understand their customer base. Furthermore, we believe the acquisition of MuleSoft effectively expanded the company's total addressable market by unlocking data previously trapped on legacy systems, to be used on the Salesforce platform. These factors compounded by a strong management team keep us confident that the company remains on track to reach its FY2022 target of $21 billion to $23 billion in revenue." In 2018, Salesforce traded as high as $161.19 on Oct. 1 then declined 29% to its Nov. 20 low of $113.60. This bear market decline was consolidated until a series of new highs began on Feb. 11. The stock closed Dec. 31 at $136.97, which was a major input to my proprietary analytics. This resulted in my annual value level at $123.65, semiannual pivot at $139.59 and quarterly risky level at $164.96. The stock gapped above $139.59 on Jan. 4 and at the same time gapped above the 200-day simple moving average, which is now at $143.29. This targeted my quarterly risky level at $164.96, which was tested Friday morning. The close of $163.65 on Feb. 28 resulted in a monthly pivot for March at $162.51, which was a magnet so far Friday. The weekly chart for Salesforce is positive but overbought with the stock above its five-week modified moving average of $154.06. The stock is well above its 200-week simple moving average or "reversion to the mean" at $97.18. This milestone was last tested at $54.49 during the week of Feb. 12, 2016 as a major buying opportunity. The 12x3x3 weekly slow stochastic reading is projected to end this week at 90.72, well above the overbought reading of 80.00. The 12x3x3 weekly slow stochastic reading scales between 00.00 and 100.00 where a reading below 20.00 is oversold and a reading above 80.00 is overbought. I view a reading below 10.00 as an indication that a stock is "too cheap to ignore." Salesforce has a reading above 90.00, which I view as an "inflating parabolic bubble." The weekly chart also shows a new warning called a weekly "key reversal." This happens after a stock sets an all-time intraday high then closes the week below the prior week's low. Friday's all-time intraday high for Salesforce was $166.15 and last week's low was $162.17. This is a key level to watch at Friday's close. Trading Strategy: Reduce holdings with the stock between my quarterly pivot at $164.96 and the week's high of $166.15. Given a positive reaction to earnings, the upside is not known, but $164.96 and $162.51 will likely act as post-earnings pivots. If the stock suffers a correction, the downside risk is to the 200-day simple moving average at $143.30.